Oneg sponsored by Sisterhood & CST in honor of Rabbi Gerry’s ordination. Kiddush sponsored by Fran Ginsburg in honor of her husband Rabbi Gerry’s ordination. Mazel Tov to Rabbi Gerry Ginsburg on being ordained! Many congratulations from the entire CST community!! Let’s welcome our new office manager, Betsey Dunkley, to CST and best wishes to Nicole on her future endeavors as this is her last month working with us. Save the Date! 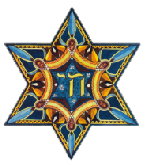 Yom Hashoah Service will be at Temple Beth El this year on May 2nd at 7PM.